The property consists of 24 acres of back land located off Wesson Road in the northeastern section of Grafton. The land has no frontage but is geographically close to the discontinued road of Old Wheelock Road. This may have been the previous access point, but that is not provable to date. 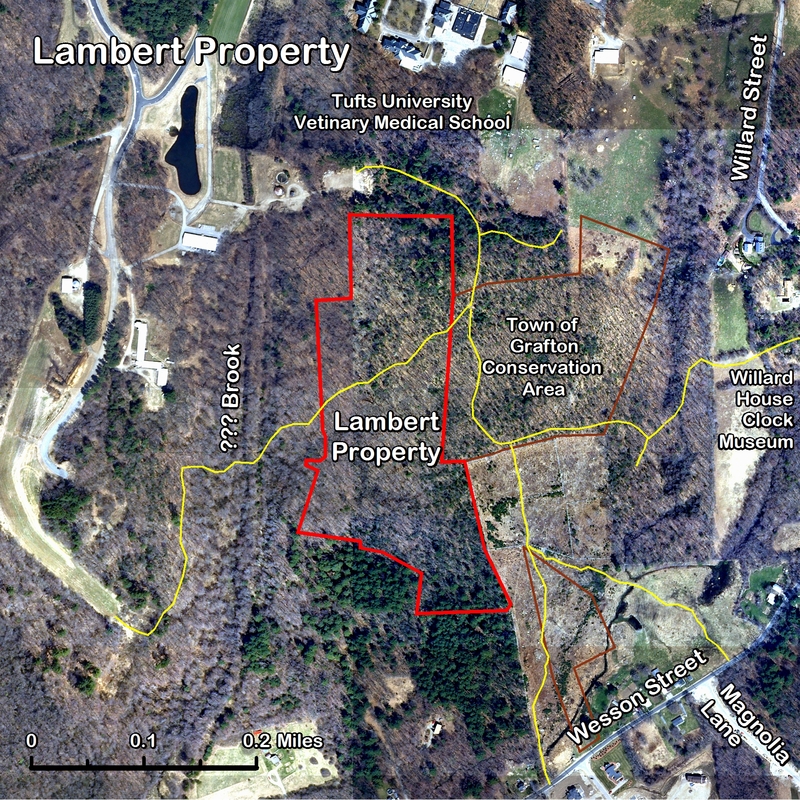 The land is bordered by Art Carlson's property, Town forest, Tufts Veterinarian School, and Long Shadow Horse Farm. The horse farm used this land for a horse riding trail into the 90s. Interested in learning more about this property? Check out our blog article about Lambert. The land was taken by the Town of Grafton for tax title and subsequently auctioned off. Theodore Lambert purchased the land and then conveyed the land to his wife, Maureen Biddle Lambert. Old deeds dating from the early 19th century indicated that there was frontage on a road, and access by a right of way. Research of maps dating to 1870 does not provide enough detail on the owner to find such a road location. Accordingly, it has been deemed that this land may never have had direct access. Historically this property was used as a horse path and logged through the 1990s. "Hey Jim! Haven't seen you since we used to hunt together on that area up behind Tufts off Wesson Road." "Yeh. There was some nice deer through there. I guess the Town has a portion of it and Tufts has their Biotech Park planned for an area nearby." "Yep. Couple houses have gone up there too along the street. :"
"Wasn't some of that the Lambert land?" "Yes. I wonder whatever happened to that piece of property." In case you have wandered through this area behind Tufts you will be interested in knowing that 24 acres of property at the end of 'Old Wheelock Road' at the back off Wesson Street will be preserved as conversation land as a result of a gift by Mrs. Maureen Lambert to the Grafton Forest and Land Conservation Trust. This 24 acre piece sits in the middle of a much larger wetland and high ground forested area. Species such as elm, red maples, high bush blueberry, and pine an evidence of both hickory and chestnut are seen here. This area was logged over about 10 years ago and new growth of oak and pine is creating a good habitat for many specifies of small woodland animals. If you wander here you may see rabbits, deer grouse, and perhaps hear some of the many songbirds that inhabit these woods. A riding trail skirts the upper ridge which runs along the eastern edge of the property and leads into the Town forest land. To access this property you will presently have to gain permission of one of several landholders on Wesson Road, Tufts University, or from the Willard House Clock Museum as these are the properties that surround this area. 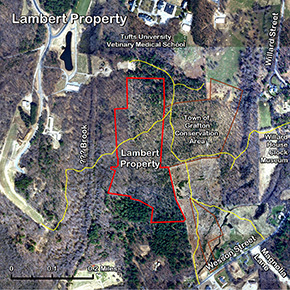 In giving this gift Mrs. Lambert indicated that she was particularly watchful for a recipient who would preserve it as a wildlife habitat and who would care for the property through responsible land management practices. The Grafton Land Trust is a leader in Grafton having established four such plans through the Federal Forest Stewardship Program. This program not only pays 75% of the cost of developing such plans, but also assists in certain trail cutting initiatives and responsible up to date forest improvement activities. Although specific goals for this property have not yet been established, the Land Trust welcomes this gift because it is central to such a large wetland habitat and looks forward to working with other agencies and landowners in this area to establish good conservation practices in the immediate long term future.